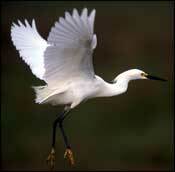 How Can You Assist Migratory Landbirds? To survive, birds need habitat. Exactly what type and how much depends on each species' food preferences, foraging strategies, and nest site requirements. Some kinds of birds do fine in suburban and even urban areas. But species whose requirements are specific, in particular, birds that require large tracts of woodland or grassland are having more difficulty. For example, the Swainson's Warbler, a bird of southeastern bottomland hardwood forests, requires about 25 acres of habitat per breeding pair, and a single pair usually will not nest until other pairs inhabit the area too. 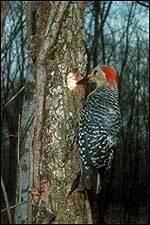 Maintaining a viable population of these birds requires a forested tract of approximately 5,000 acres. For species with specific habitat requirements we must maintain suitable habitat in the face of human activity, and the challenge is heightened by the fact that, unlike humans, birds do not pay attention to land ownership. Because their habitats cross legal boundaries, habitat protection must follow their lead. Is protecting habitat for migratory birds a realistic goal for the 21st century? You bet! Many amateur birders, conservationists, and private landowners support the conservation of bird populations and their associated habitats before species reach critically low levels- at which point intervention becomes expensive and controversial. 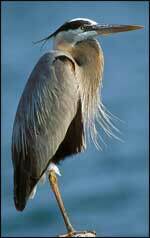 Maintaining habitat can and does occur on the local, state, regional, national and international levels. In order for habitat conservation to be successful, habitat maintenance should follow several guiding principles. These can be applied to the conservation of breeding range, wintering grounds, and migratory corridors. All land managers, public and private, should find these principles helpful in guiding their plans to enhance, and or, conserve migratory bird habitat. Perhaps the most important aspect of habitat conservation is what YOU (as an individual) can do to conserve or enhance habitat for birds. Grow native plants that provide fruits or trees. Woodlots with fallen limbs and leaves, dead plant material, and other woodland debris harbor the insects that migratory birds thrive on. Leave as much dead plant material, as possible, on the land. Seek alternatives to chemical pesticides. Use biological controls for unwanted insects and vegetation. Reduce the risk of bird predation by keeping pet cats indoors. Refrain from putting out table scraps, which will attract predators, such as raccoons. Invite neighboring landowners to join your backyard effort. Plan cooperatively. Avoid fragmenting existing grassland tracts. The larger the grassland, the greater number of area-sensitive species that will be able to nest successfully in the area, for example, the Upland Sandpiper and Henslow's Sparrow. When restoring grasslands, minimize the amount of edge habitat by designing roughly circular or square plots. Such programs should use native grasses and local seed sources. Determining the species that should occur at a given site may require research. To benefit area-sensitive birds, plots should be no smaller than 125 acres, and preferably, 250 acres or more. Fifty acres or less will benefit birds that are the least sensitive to area size, for example, Dickcissel and Red-winged Blackbird. If the plots are smaller than 50 acres the only recommended option is that they must be as numerous as possible and no farther than one mile apart. Monitor grass height. Eliminate woody vegetation that grows higher than the native grasses. Grasslands evolved with regular cycles of burning. Learn about prescribed burns and evaluate the possibility of instruction in this practice. Maintain a well-developed understory, including woody and herbaceous vegetation, to provide resources to a diverse set of woodland species. Minimize the amount of edge habitat. Protect or restore forest along streams, wide stream bottoms, and ravines can be crucial to migratory birds. Remove non-native plant species, for example, Kudzu and Salt cedar. After harvest, leave crop residue on the soil surface. This residue supports insects that are crucial to the diets of migrants and provides cover during inclement weather. Use biological controls on crops pests. Integrated pest management systems that achieve this end include establishing permanent vegetative cover on steep hillsides, reducing the frequency and intensity of tillage, and rotating crops over several years. These techniques reduce the need for chemical pesticides and fertilizers and ensure that only the target pest insects are destroyed. Postpone spring mowing as long as possible, avoid mowing at night, and make intervals between mowing as long as possible to give birds the best chance for successful nesting. Use inorganic fertilizers sparingly; base use in accurate soil requirements. Do not mow fence rows and other uncultivated areas or spray them with pesticides. Try to carry out field operations in these areas only before and after nesting seasons. Leave wooded corridors of shrubs or standing trees between fields. Preserve uncultivated areas and allow them to develop into a variety of vegetation types. Areas between crop fields are helpful to migratory birds and reduce soil erosion. Use farmland in a wide variety of ways. For example, maintain grassy strips within cultivated fields to provide nesting and feeding areas for grassland birds and preserve wetlands by buffering them with a wide zone of natural vegetation. Do not overlook small habitat patches. Small plots of trees, shrubs, or grasses are used by migrating birds and maintenance of these areas should be encouraged. All development should take into account the needs of migratory birds. During construction, as little habitat as possible should be destroyed. This can help birds and increase home and property values. Avoid placing structures on ridge tops. Birds tend to follow ridges during migration. Structures built along migration routes pose serious threats to millions of birds that are killed when they strike windows, power lines, and towers. Avoid placing structures within or adjacent to wetlands. Wetlands are particularly important to migratory birds because of the abundance of food and cover. When building along a known flight path, consider the orientation of the structure. If possible, place houses so that large windows do not sit perpendicular to the migration flight path (in most places this is north and south) Elevated telephone poles and lines can also cause serious problems. Community plans should include tracts of native habitat. Cluster housing, localizing homes within large tracts of land, is a helpful technique to achieve this goal.